The piece toady brings to the centre a condition known as endometriosis which afflicts women relegated currently as a woman’s issue and one related to their health. For those affected it literally paralyses them. Syl suffers from endometriosis. Endometriosis (endo) currently has no known cause and no cure. It can cause severe pelvic pain and infertility. Back in 2013, Syl's university tutor, who also had endo, offered to mentor her through an honours thesis on coverage of endometriosis in the media. Their web search for media mentions of endometriosis returned zero mentions of the disease in any major Australian media outlets over 10 years. The tutor withdrew her offer, saying Syl couldn't do a literature review with nothing to review. Today, Sylvia, 27, is having a good day. She's able to sit upright on a chair opposite me and her mum, Lesley at their home in Sydney. In the past, endo often left her unable to sit up, walk or even do up her jeans. Syl feels much better now partly thanks to effective excision surgery, daily self-management and Visanne - a drug designed to treat endo. This medication is now available in Australia because Lesley and Sylvia took on pharmaceutical giant Bayer - and won. Lesley discovered that Visanne was having success in treating endo-related pain overseas, but Bayer would not bring it to Australia and New Zealand. “The marketing manager said I'd need to convince them there's a market for it here,” she says. Lesley started emailing her friends, but Syl thought there had to be a quicker way. She shared her story on Change.org, asking people to sign their petition targeting Bayer. The signatures would prove the need. From there they founded their own not-for-profit, EndoActive, which raises awareness, provides evidence-based information and advocates on behalf of the 700,000 women and girls with endo in Australia. They convened Australia's first patient-centred endometriosis conference in 2015. This awareness, along with work by others, helped bring about Australia's first National Action Plan for Endometriosis, launched last month. “[Endo] is a silent epidemic, hidden due to stigma, misunderstanding, and society's easy dismissal of the importance and severity of pain in women,” says Dr. Susan Evans, a gynaecologist who is chair of the Pelvic Pain Foundation of Australia. The Medical Faculty of the University of Sri Jayewardenepura Gynaecology Endometriosis Centre (SAMAGE) was established at the Colombo South Teaching Hospital (Kalubowila Teaching Hospital) under the professorial unit in Obstetrics and Gynaecology, University Sri Jayewardenepura. The SAMAGE centre will be a referral centre for all complex gynaecological problems with special interest in endometriosis. Dr. Dhammika Silva, Head of the Department of Obstetrics and Gynaecology, University of Sri Jayewardenepura and Consultant Obstetrician and Gynaecologist will be heading the Gynaecological team at Kalubowila. It's estimated that one in 10 women have endo. It occurs when tissue similar to the womb lining grows outside it in other parts of the body (from reproductive organs up to the brain), in some cases strangling and gluing together other organs, causing excruciating pain. Women have had to face such challenges in the diagnosis and treatment of endo, that Health Minister Greg Hunt made a national apology in December to recognise the pain and problems they've encountered in receiving adequate medical advice and treatment. “Hearing that was so moving,” Syl says. Mr. Hunt recently made a A$4.7m (£2.7m; $3.4m) commitment to the National Action Plan for Endometriosis and Syl now sits on the steering committee. Their first meeting will have many action points but debunking myths is high on Syl's list. “Like so many women, I was told by a doctor that getting pregnant would help my pain,” she says. Dr. Silva speaking to some of the local media, he stated that there was a time when “frozen Pelvis”, a condition caused by severe endometriosis was inoperable. It was considered so because it involved even the ureters, bowel and nerves around it. While Kalubowila Teaching Hospital has a centre for treatment. 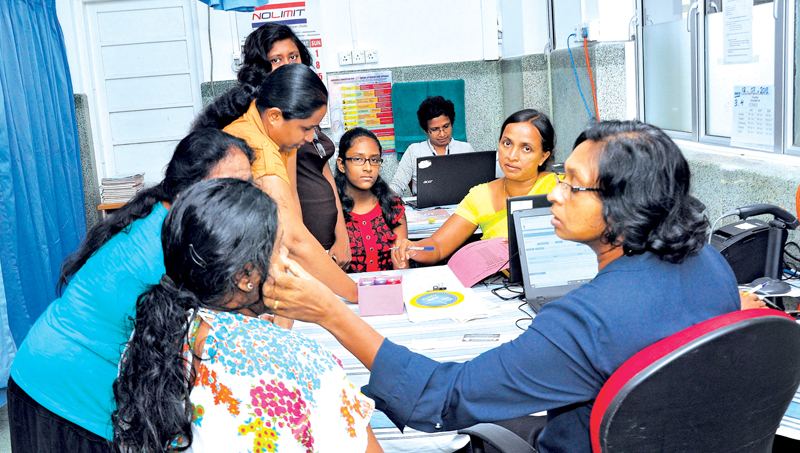 For the average Sri Lankan woman outside of Colombo who may well be suffering there may well be little assistance. For couples or partners it must cause havoc leaving the woman sufferer high and dry with little or no recourse to advice or relief. They would also be treated as freaks with unusual health problems with failing relationship issues. The numbers would clearly overwhelm even Kalubowila if it were to be the only facility in the country. Would Sri Lanka like Australia consider a national focus?